Describe the relationship between the speed of sound, its frequency, and its wavelength. Describe the effects on the speed of sound as it travels through various media. Describe the effects of temperature on the speed of sound. Sound, like all waves, travels at a certain speed and has the properties of frequency and wavelength. You can observe direct evidence of the speed of sound while watching a fireworks display. The flash of an explosion is seen well before its sound is heard, implying both that sound travels at a finite speed and that it is much slower than light. You can also directly sense the frequency of a sound. Perception of frequency is called pitch. The wavelength of sound is not directly sensed, but indirect evidence is found in the correlation of the size of musical instruments with their pitch. Small instruments, such as a piccolo, typically make high-pitch sounds, while large instruments, such as a tuba, typically make low-pitch sounds. High pitch means small wavelength, and the size of a musical instrument is directly related to the wavelengths of sound it produces. So a small instrument creates short-wavelength sounds. Similar arguments hold that a large instrument creates long-wavelength sounds. where is the speed of sound, is its frequency, and is its wavelength. The wavelength of a sound is the distance between adjacent identical parts of a wave—for example, between adjacent compressions as illustrated in Figure 2. The frequency is the same as that of the source and is the number of waves that pass a point per unit time. Figure 2. A sound wave emanates from a source vibrating at a frequency f, propagates at vw, and has a wavelength λ. Table 1 makes it apparent that the speed of sound varies greatly in different media. The speed of sound in a medium is determined by a combination of the medium’s rigidity (or compressibility in gases) and its density. The more rigid (or less compressible) the medium, the faster the speed of sound. This observation is analogous to the fact that the frequency of a simple harmonic motion is directly proportional to the stiffness of the oscillating object. The greater the density of a medium, the slower the speed of sound. This observation is analogous to the fact that the frequency of a simple harmonic motion is inversely proportional to the mass of the oscillating object. The speed of sound in air is low, because air is compressible. Because liquids and solids are relatively rigid and very difficult to compress, the speed of sound in such media is generally greater than in gases. Table 1.Speed of Sound in Various Media. Earthquakes, essentially sound waves in Earth’s crust, are an interesting example of how the speed of sound depends on the rigidity of the medium. Earthquakes have both longitudinal and transverse components, and these travel at different speeds. The bulk modulus of granite is greater than its shear modulus. For that reason, the speed of longitudinal or pressure waves (P-waves) in earthquakes in granite is significantly higher than the speed of transverse or shear waves (S-waves). Both components of earthquakes travel slower in less rigid material, such as sediments. P-waves have speeds of 4 to 7 km/s, and S-waves correspondingly range in speed from 2 to 5 km/s, both being faster in more rigid material. The P-wave gets progressively farther ahead of the S-wave as they travel through Earth’s crust. The time between the P- and S-waves is routinely used to determine the distance to their source, the epicenter of the earthquake. where is the Boltzmann constant and is the mass of each (identical) particle in the gas. So, it is reasonable that the speed of sound in air and other gases should depend on the square root of temperature. While not negligible, this is not a strong dependence. At the speed of sound is 331 m/s, whereas at it is 343 m/s, less than a 4% increase. 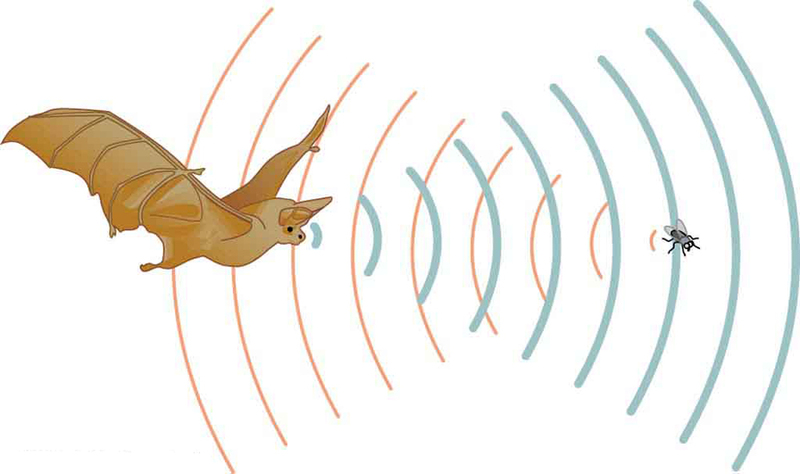 Figure 3 shows a use of the speed of sound by a bat to sense distances. Echoes are also used in medical imaging. Figure 3. A bat uses sound echoes to find its way about and to catch prey. The time for the echo to return is directly proportional to the distance. In a given medium under fixed conditions, is constant, so that there is a relationship between and the higher the frequency, the smaller the wavelength. See Figure 4 and consider the following example. Figure 4. Because they travel at the same speed in a given medium, low-frequency sounds must have a greater wavelength than high-frequency sounds. 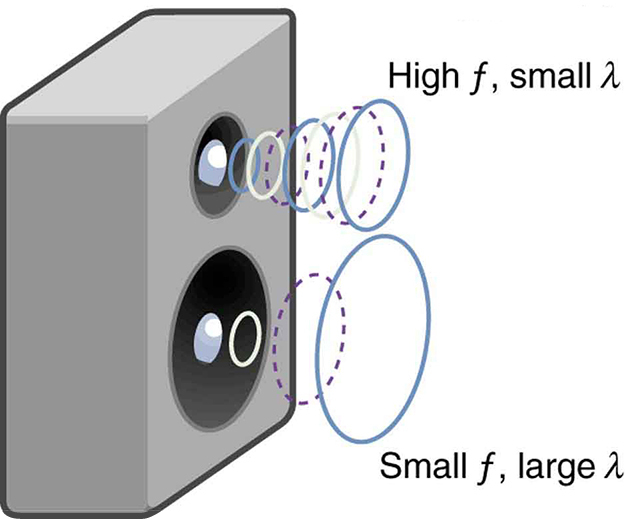 Here, the lower-frequency sounds are emitted by the large speaker, called a woofer, while the higher-frequency sounds are emitted by the small speaker, called a tweeter. Example 1: Calculating Wavelengths: What Are the Wavelengths of Audible Sounds? Because the product of multiplied by equals a constant, the smaller is, the larger must be, and vice versa. The speed of sound can change when sound travels from one medium to another. However, the frequency usually remains the same because it is like a driven oscillation and has the frequency of the original source. If changes and remains the same, then the wavelength must change. That is, because the higher the speed of a sound, the greater its wavelength for a given frequency. Suspend a sheet of paper so that the top edge of the paper is fixed and the bottom edge is free to move. You could tape the top edge of the paper to the edge of a table. Gently blow near the edge of the bottom of the sheet and note how the sheet moves. Speak softly and then louder such that the sounds hit the edge of the bottom of the paper, and note how the sheet moves. Explain the effects. Imagine you observe two fireworks explode. You hear the explosion of one as soon as you see it. However, you see the other firework for several milliseconds before you hear the explosion. Explain why this is so. You observe two musical instruments that you cannot identify. One plays high-pitch sounds and the other plays low-pitch sounds. How could you determine which is which without hearing either of them play? which is the same relationship given for all waves. is the same for all frequencies and wavelengths. 1: How do sound vibrations of atoms differ from thermal motion? 2: When sound passes from one medium to another where its propagation speed is different, does its frequency or wavelength change? Explain your answer briefly. 1: When poked by a spear, an operatic soprano lets out a 1200-Hz shriek. What is its wavelength if the speed of sound is 345 m/s? 2: What frequency sound has a 0.10-m wavelength when the speed of sound is 340 m/s? 3: Calculate the speed of sound on a day when a 1500 Hz frequency has a wavelength of 0.221 m.
4: (a) What is the speed of sound in a medium where a 100-kHz frequency produces a 5.96-cm wavelength? (b) Which substance in Table 1 is this likely to be? 5: Show that the speed of sound in air is 343 m/s, as claimed in the text. 6: Air temperature in the Sahara Desert can reach (about ). What is the speed of sound in air at that temperature? (b) Discuss the limits this time resolution imposes on the ability of the sonar system to detect the size and shape of the object creating the echo. 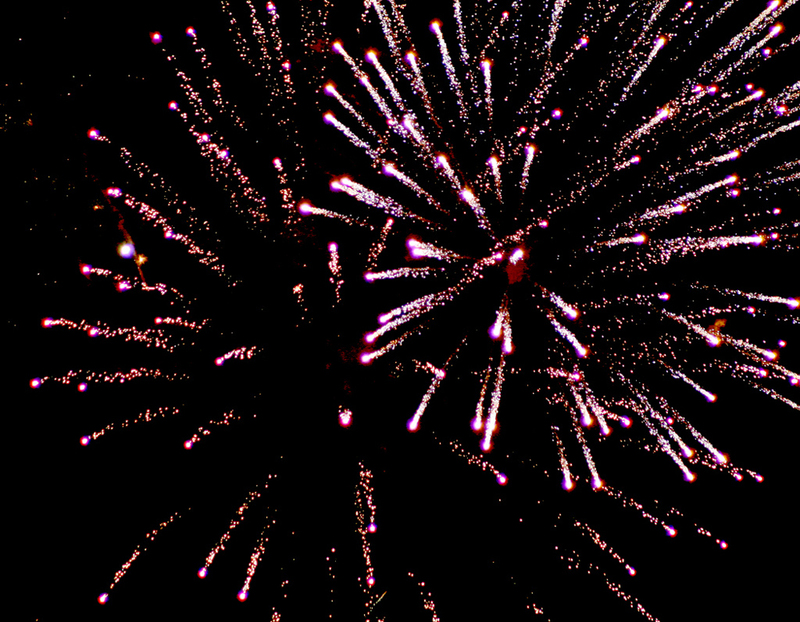 10: A physicist at a fireworks display times the lag between seeing an explosion and hearing its sound, and finds it to be 0.400 s. (a) How far away is the explosion if air temperature is and if you neglect the time taken for light to reach the physicist? (b) Calculate the distance to the explosion taking the speed of light into account. Note that this distance is negligibly greater. Sound and light both travel at definite speeds. The speed of sound is slower than the speed of light. The first firework is probably very close by, so the speed difference is not noticeable. The second firework is farther away, so the light arrives at your eyes noticeably sooner than the sound wave arrives at your ears. Compare their sizes. 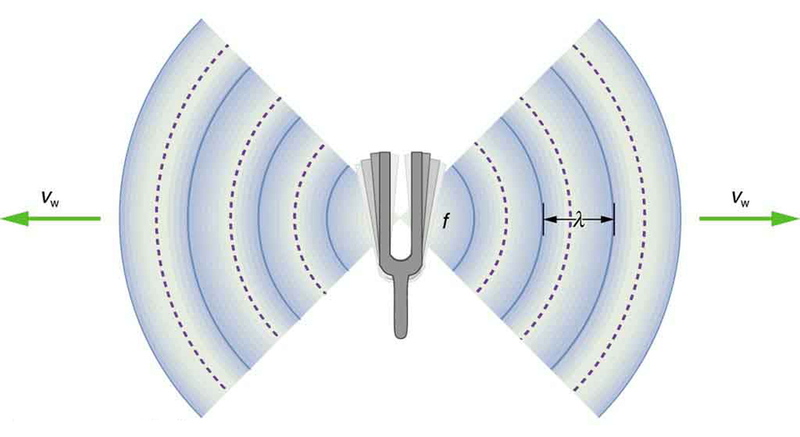 High-pitch instruments are generally smaller than low-pitch instruments because they generate a smaller wavelength. (b) This means that sonar is good for spotting and locating large objects, but it isn’t able to resolve smaller objects, or detect the detailed shapes of objects. Objects like ships or large pieces of airplanes can be found by sonar, while smaller pieces must be found by other means. (c) This uncertainty could definitely cause difficulties for the bat, if it didn’t continue to use sound as it closed in on its prey. A 5% uncertainty could be the difference between catching the prey around the neck or around the chest, which means that it could miss grabbing its prey. 17.2 Speed of Sound, Frequency, and Wavelength by OpenStax is licensed under a Creative Commons Attribution 4.0 International License, except where otherwise noted.